Lake Resources NL (ASX:LKE) is pleased to report that it has contracted Foraco International SA to expand current drilling capacity and depth potential at Lake's 100% owned Cauchari Lithium Brine Project (see Figure 1 in link below). The larger more capable diamond drill rig is mobilising to site and will arrive next week. Two rigs will now be operational at Cauchari. 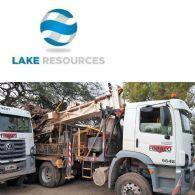 Lake Resources NL ( ASX:LKE ) is a lithium exploration and development company focused on developing its three lithium brine projects and hard rock project in Argentina, all owned 100%. The leases are in a prime location among the lithium sector's largest players within the Lithium Triangle, where half of the world's lithium is produced. Lake holds one of the largest lithium tenement packages in Argentina (~200,000Ha) secured in 2016 prior to a significant 'rush' by major companies. The large holdings provide the potential to provide consistent security of supply demanded by battery makers and electric vehicle manufacturers.